I have a great book to share with all of you today. 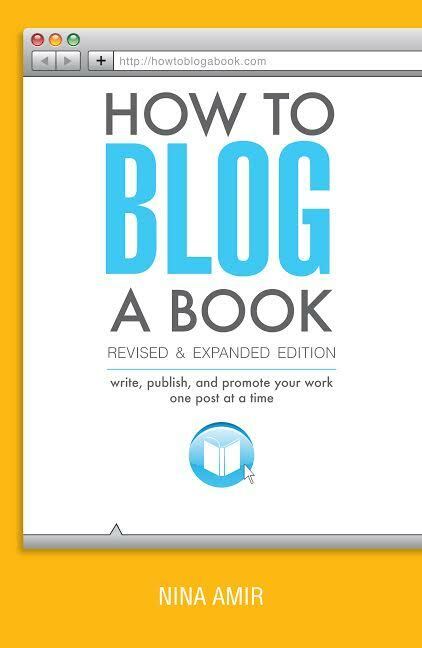 This book will be especially helpful for writers and bloggers who want to blog a book. About the Book: How to Blog a Book Revised and Expanded Edition by Nina Amir is a complete guide on how to create a saleable book based on your blog. Amir, expert author and blogger, teaches you how to create content that will increase your chances of becoming a published author. Reasons you might want to blog a book. Steps to writing a book using blog posts. How to write a book proposal. Tips on getting more traffic to your blog. How to market your blog both online and offline. How to turn your blog into a book once it's complete. Success stories of authors who have received blog-to-book deals. 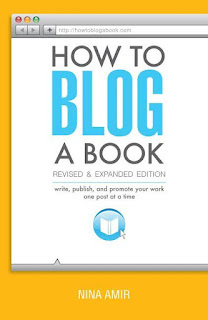 My Thoughts: This book provides a wealth of information to writers and bloggers who want to blog a book. I learned a lot about the traditional process of finding an agent and publisher as well as how someone can attract an agent and garner a publication deal from his blog. Amir is very detailed in her book and gives a lot of examples to help illustrate what she's talking about. In her book proposal chapter, for instance, she shares excerpts from her own book proposal to show readers what sections of a book proposal might look like. Amir also details how to set up a blog, how to increase your blog's visibility, and how to use the power of social media to drive traffic to your site. I believe these sections of the book would be most helpful to beginning bloggers. I don't believe advanced bloggers would learn new information from these sections, though they may serve as a good reminder to the basics of blogging and social media. Amir also only focuses on WordPress as a blogging platform. She provides numerous tips, plugins, and resources for bloggers wanting to use WordPress. Those wanting to use a different blogging platform will need to look elsewhere for information on setting up and managing their blog. Overall, I would definitely recommend this book to anyone who is interested in blogging a book. The information provided in this book is invaluable. 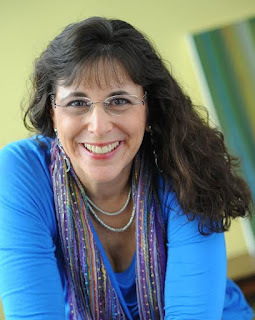 About the Author: Nina Amir, the bestselling author of How to Blog a Book and The Author Training Manual, is a speaker, a blogger, and an author, book, and blog-to-book coach. Known as the Inspiration to Creation Coach, she helps creative people combine their passion and purpose so they move from idea to inspired action and positively and meaningfully impact the world as writers, bloggers, authorpreneurs, and blogpreneurs. Some of Nina’s clients have sold 300,000+ copies of their books, landed deals with major publishing houses and created thriving businesses around their books. She is the founder of National Nonfiction Writing Month, aka the Write Nonfiction in November Challenge, and the Nonfiction Writers’ University. As a hybrid author she has published 15 books and had as many as four books on the Amazon Top 100 list at the same time. Enter to win one of seven copies of How to Blog a Book. One winner will also win a $25 Amazon gift card. Another winner will win a course from the Non-fiction Writers University. This giveaway is open to people in the United States and Canada. If you win, you will receive an email from iRead Book Tours, not Fur Everywhere. You can enter the giveaway at iRead Book Tours HERE using the Rafflecopter widget. Good luck! You can purchase the book on Amazon and Barnes & Noble. Disclaimer: I received an eBook copy of "How to Blog a Book Revised and Expanded Edition" by Nina Amir in exchange for an honest review. Receiving the free eBook did not influence my opinion in any way. All opinions shared on Fur Everywhere are my own. Sounds like a great book, I will head over to enter. I am praying for Milita. Thanks for the heads up on this - sounds like a great book! That does sound good. Purrs to dear Lita from all of us. Thanks for this review and letting us know about this book. Sure Hope I win one of them. My human did this with Sparkle's advice columns... twice! I am going to enter this giveaway. It sounds like a very helpful book. Thanks so much. We entered! Sending Lita prayers. Thanks so much for hosting me on your blog! I hope some of your readers blog their books or book their blog! That sounds like a really informative book! We'll go check it out now. And we will keep purring and praying for sweet Lita. Hmmm, we nevfur would have thought of that! Imagine! Excellent! I've just started my blog, and I haven't even thought of myself as a book author- the sky's the limit! That book sounds awesome! Thanks for sharing! That does sound like it has a ton of great information for us bloggers; I've always been curious about the crossover between blog posts & writing a book. Really pawesome blog post about creating a book from a blog! Thanks for sharing dis - and for shouting out about the give away. Your write up helped me determine I need to get dis! Great idea and resource. This is what our publishing panel discussed at BlogPaws. This sounds great! Definitely entering! Very cool! I'm hoping to have a book accompanying my blog one day, but it is a goal for the future. Right now I have a few other cool things on my plate. I will have to enter the giveaway! Sounds like a great book! As a published author, I've toyed with doing a book about my blog and this sounds like a great resource. Thanks for the info! This sounds like a really informative book, what a great contest! Sharing & entering.